© Matt Groening, All Rights Reserved. Watch the TV interview where Gene talks about energy on the Interviews Section of this website. If possible, abstain from any other forms of energy work for at least a week before and a week after your scheduled session. If that's not possible, come anyway. If you can, get a good night's sleep before coming. If that's not possible, come anyway. Eat before you arrive, so that your mind isn't on food during the session. eat green leafy vegetables and if you can't, come anyway. If possible, for a few days before, think of which aspects of yourself you'd like to change or improve upon. They can be physical, mental, emotional or spiritual. Let go of any expectations you may have as they only get in the way. Dress in comfortable clothing and prepare to have a wonderful experience! Please Note: If you have a contagious disease, are using a wheelchair or walker, please let us know before coming so that preparations can be made. 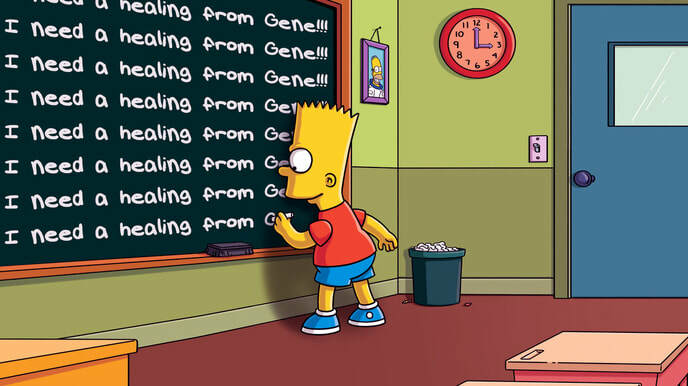 Gene always tells his students, "The most embarrassing thing for a healer is to call in sick!" Even though the statement was meant to sound amusing, due to the amounts of negative energy that healers absorb, it sometimes makes them more susceptible to catching diseases.